Lotoo PAW Gold is a gold-plated hi-res music player | What Hi-Fi? 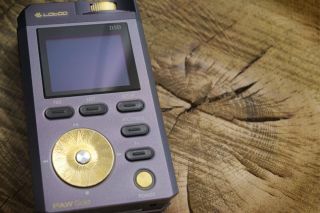 There’s a fancy new portable hi-res music player in town, and it’s called the Lotoo PAW Gold. Lo-who? According to the official blurb, Lotoo is a Beijing-based maker of automation and production systems for broadcast radio and televison. But the company says the PAW Gold is a reference quality music player for audiophiles. Inside, you’ll find a PCM1792 DAC chip and LME49600 headphone amp, and it’s compatible with an exhaustive range of audio formats: DSD, FLAC, WAV, AAC, ALAC, MP3, WMA, M4A, CUE, APE and WavePack. A USB 3.0 (micro-B) port allows for high transfer speeds, while for storage, the Lotoo is compatible with SDHC and SDXC cards up to a hefty 2TB. There are two 3.5mm outputs, headphone and line out, while the 6000mAh lithium polymer battery has a quoted playtime of 11 hours. For navigation, Lotoo has chosen not to adopt the touchscreen approach, much like the PonoPlayer. Instead, you control the device with hard keys and something that looks not unlike a Mayan calendar. The screen, which is protected by sapphire glass, is a 1.8in OLED display with a fairly unimpressive screen resolution of 160x128. All of this is housed in a full-metal chassis, made of ‘aircraft grade’ aluminium alloy. Those shiny bits, however, are plated in 24K gold. How much? The Lotoo PAW Gold costs £1500. It is available now.